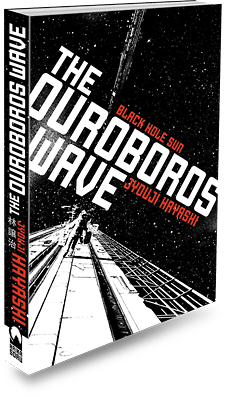 ﻿ THE OUROBOROS WAVE « Haikasoru: Space Opera. Dark Fantasy. Hard Science. Ninety years from now, a satellite detects a nearby black hole scientists dub Kali for the Hindu goddess of destruction. Humanity embarks on a generations-long project to tap the energy of the black hole and establish colonies on planets across the solar system. Earth and Mars and the moons Europa (Jupiter) and Titania (Uranus) develop radically different societies, with only Kali, that swirling vortex of destruction and creation, and the hated but crucial Artificial Accretion Disk Development association (AADD) in common. The Ouroboros Wave is an ebook! Born in Hokkaido in 1962. Having worked as a clinical laboratory technician, Jyouji Hayashi debuted as a writer in 1995 with his cowritten Dai Nihon Teikoku Oushu Dengeki Sakusen. His popularity grew with the Shonetsu no Hatou series and the Heitai Gensui Oushu Senki series—both military fiction backed by real historical perspectives. Beginning in 2000, he consecutively released Kioku Osen, Shinryakusha no Heiwa and Ankoku Taiyo no Mezame, stories that combine scientific speculation and sociological investigations. He continues to write and act as a flag-bearer for a new generation of hard SF. “Not personally, no.” Tatsuya grinned. “That’s my point. The cross and the human body have different structures. Maybe the cross does suffer. We have different structures, so we can’t model its suffering mentally. ‘Thirsty’ equals ‘something to drink’—that’s knowledge a digital inference engine has no way of learning. It has to be programmed; it doesn’t know. That’s why a theory of mind is so important. AIs don’t have that ability yet.